If you want to be great at your craft, you have to put in the time. It’s as simple as that. 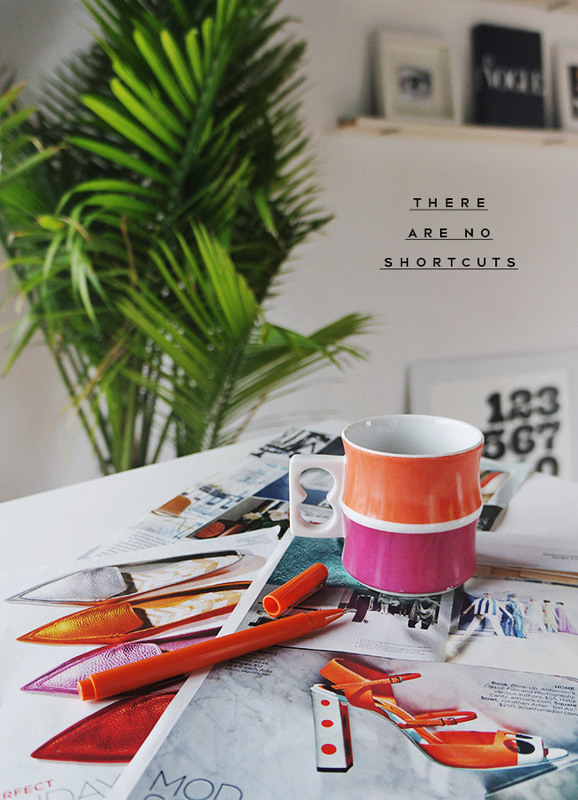 There’s a constant churn of articles, books and courses promising shortcuts to greatness. It’s hard to not be drawn into them in hopes of picking up the latest tips and tricks. While it’s true that most will help you get closer to your goal in some small way, there’s no substitute for putting in the hard work. In the book Outliers, Malcolm Gladwell famously said said that it takes roughly ten thousand hours of practice to achieve mastery in a field. After you’ve put in that amount of time, you’re considered an expert. Dedicating yourself fully to your craft and putting in those so-called 10,000 hours builds not only your skills but also your confidence. These are two things that no amount of money or advice can buy. If you’re a late bloomer and only now discovering what you want to do, don’t fret — it really is never too late. When I went back to school for design, I was one of the oldest students in my class at 25 years old. I didn’t graduate until I was 27 and as I sat in a studio surrounded by professional designers who were roughly the same age as me with years of experience already under their belt, it felt like a huge obstacle to get to their level. 10,000 hours = 1,250 8 hour days which equals roughly 3.5 years with no days off. Some of us may get there faster but honestly, it did take those 10,000 hours for me to grow into who I wanted to become and earn a decent living. It’s a long path and that’s why so many people get started and then give up. The point is to push through and to keep going. Work through those roadblocks. As those hours speed by, as you start getting hired, as you start building repeat customers and as your peers start noticing your work, you’ll feel your confidence grow. It doesn’t matter if you’re just starting on your path to greatness today. All that matters is that you’re committed to getting started. Good for you! Life is short so you’ve gotta do what you love. My age is definitely getting me at the moment, I’m turning 25 at the end of the year and I feel like I’m not where I’m supposed to be at this age. I’ve only just graduated and now I’m having to start a brand new career from scratch and I’m trying to consciously keep reminding myself that it’ll take time and that I have loads of time to get to where I want to be, but I can’t get the idea of this big ticking clock out of my head! Starting from scratch is more common than you think — while I was going through it, the ladies who sat on each side of my in my design class were in the same exact position…though I think they were each on their third career! I felt the ticking clock, too but it wasn’t a bad thing. If anything, it motivated me to work even harder so I could make up for lost time. Good luck with your new path!